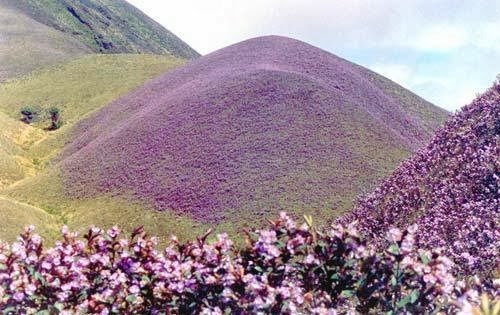 In 2018, Munnar will experience the once in 12 years blooming of the Neelakurinji flower. Kurinji or Neelakurinji (Strobilanthes kunthianus) is a shrub that is found in the shola forests of the Western Ghats in South India. 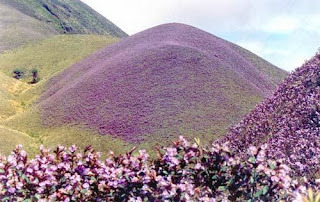 Nilgiri Hills, which literally means the blue mountains, got their name from the purplish blue flowers of Neelakurinji that blossoms only once in 12 years. In the heart of the District lies the 'IDUKKI DAM' - Asia's biggest Arch Dam of 555 feet height proudly standing between the two mountains - 'Kuravanmala' (839 meters) and 'Kurathimala' (925 meters ). This prestigeous project of our nation is situated in Idukki District and its underground Power House is located at Moolamattom which is about 19 kms from Thodupuzha. 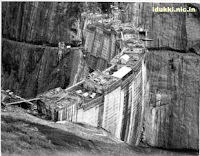 Idukki Dam is 43 kms away from Moolamattom. 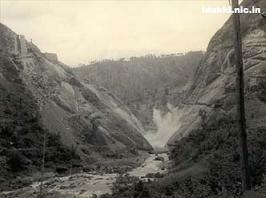 The possibility of Hydroelecric development at Idukki was first conceived in 1919. 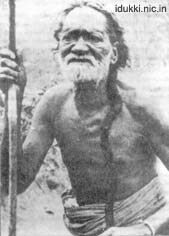 As per history Shri Kolumban, the head of 'Oorali' race during 1922 showed the way, to the Malankara Estate Superintendent and his friend Thomas, who were on hunting spree in the forest, the spot of present Arch Dam. He told them of the legend of Kuravan and Kurathi Hills. The mind of Thomas was stirred by the sight of water flow between the mountains and his idea made the dream true of Idukki Arch Dam. Sri. 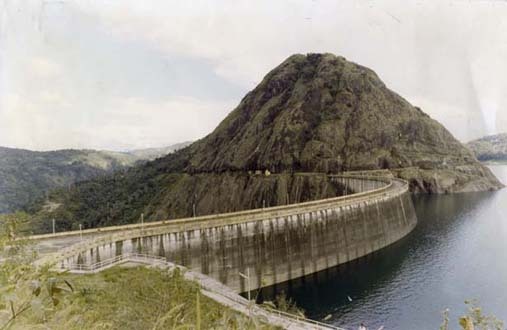 W.J.John of Malankara Estate submitted a report to the Government of Travancore in 1932 on the possiability of constructing a dam at Idukki for Power Generation. 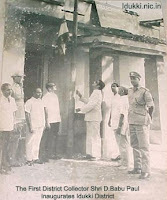 In 1947 Sri.P.Joseph John,then Chief Electrical Engineer to the Government of Travancore made a preliminary investigation report. On the request made by the Government, the Central Water and Power Commission took up detailed investigation in 1956. The project report was prepared in 1961 and the Planning Commission accorded sanction for implementing the scheme in 1963 and the preliminary works of the project were started. The project was posed for Canadian aid and its scope was enlarged and a revised project report was drawn up in 1956-66. 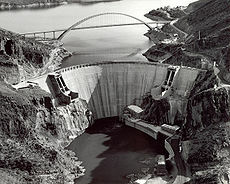 The construction of this Dam commenced on 30 April 1969. 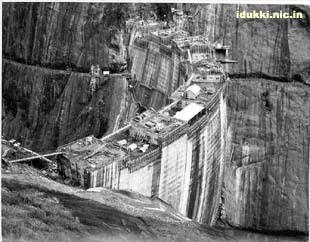 Storage of water in idukki reservoir commenced in February,1973. The inauguration of trial run of the first machine was celebrated on 4th October,1975. Commercial operation of the Power Station was Commissioned on 12 February 1976 by the then Hon. Prime Minister Smt. Indira Gandhi. Construction of this Arch Dam and two other dams at Cheruthony and Kulamavu has created an artificial lake of 60 sq. kms. width and the water stored, is utilised for production of electricity at the unique Moolamattom Power house, which is located inside the rocky caves. The Government of Canada aided the Project with long term loans and grants. M/s S.N.C.Inc., Canada, a well-known firm of Consulting Engineers were advising and assisting Project Engineers under the Canadian Aid. The installed capacity of the Power House is 780MW consisting of 6 Units of 180 MW each.The regulated waters of Periyar falls through a drop of about 669.2 metres (2195 feet) while generating power in the underground power house. The tail waters flowing to Kudayathurpuzha through tunnel and open channel will later be diverted for irrigation purposes in the Muvattupuzha Valley. Karikode near Thodupuzha was the head quarters of Vadakkumkoor Raja. There is remains of a fort at Karikkode. Near this fort there is a Devi temple said to have constructed by the Vadakkumkoor Raja. There is also another temple by name Annamala Temple constructed in Chola style. The church at Muthalakodam, near Thodupuzha is believed to have constructed before 13th Century. The Ninnar Mosque near Karikkode is said to have constructed by the Vadakkumkoor Raja for his Muslim soldiers. Thodupuzha was also a nerve business centre. There is historical evidence to prove that from ancient time onwards ivory, teak, rosewood, sandalwood, peacock etc., were exported to foreign countries. Kannur (earlier Canannore), has carved a niche in the socio-political history of the state. The capital of erstwhile Kolathiri Rajas, the ancient town had fallen to European forces in several occasions. In 15th century, the Portuguese were the first to establish a settlement here. St. Angelo’s Fort in the city was built by the first Portuguese Viceroy in 1505. The Portuguese factory built by Cabral in 1501 was captured by the Dutch in 1663. In 1708 the British built a fort at Thalassery ( earlier Tellichery), another coastal town in Kannur. The nearby Mahe became a French colony in the 18th century. In 1940's, Kannur became an effervescent political cauldron. Communism was the provocation. The district hamlets witnesses bouts of violence which left indelible impressions on the political landscape of the district. 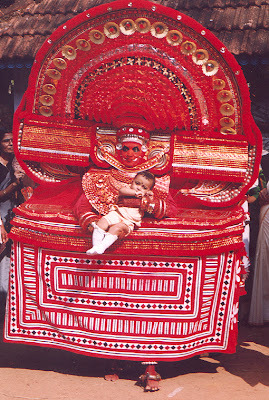 Many folk art and dance forms have roots in the socio-religious culture of the district. 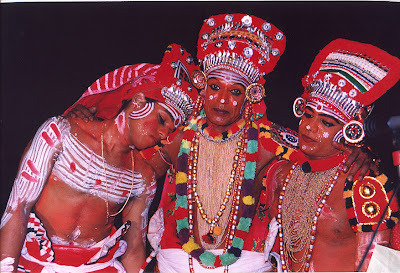 Theyyam and Kavadiyattam were nurtured and nourished by artistes from Kannur. Another stronghold of the district is weaving. As many as hundred weaving units are ticking over here. 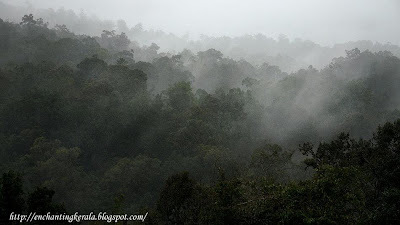 Kannur is boarded by Karnataka's Kodagu district. 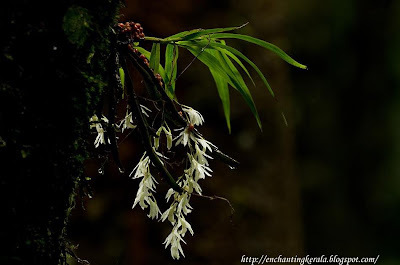 EZHIMALA : Naval academy is coming up here. 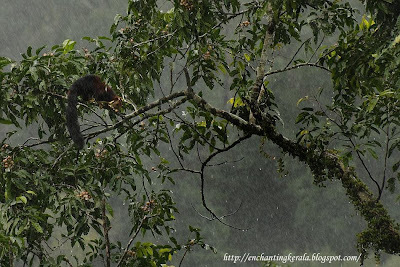 55 km from Kannur. 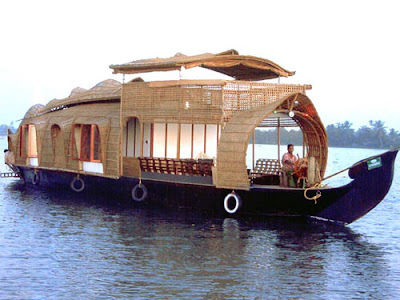 THALASSERY : A trading centre of ancient times. Dr. German Gundert, a German Missionary, brought out the first Malayalam newspaper from Illikkunnu near Thalassery in 1856. He developed the first Malayalam dictionary. The historical city is also known as the cradle of Indian circus. Many a star circus artiste hailed from Thalassery. Leading circus troupes are still owned by people from this region. India's first gymnastic training centre functions here. Air : The nearest airport at Karipur, Kozhikode 120 km away., Mangalore airport 170 km away. Rail: Kannur railway station on Mangalore- Shornore Sector. A major station in north Kerala. It is important to note that vishu is considered as the astrological New Year festival of Kerala state. This is celebrated during the month of April. 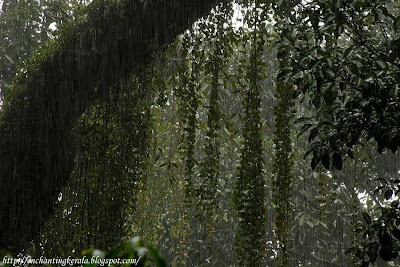 In general we can say that it is observed during first day of medam( which is the Malayalam month). It usually falls on April 14th. Most important ritual of the day is called 'Kani Kanal', the literal translation of this is 'first sight'. In Kani Kanal there is a prescribed list of items, which a person must see first thing on a Vishu morning to bring good luck. 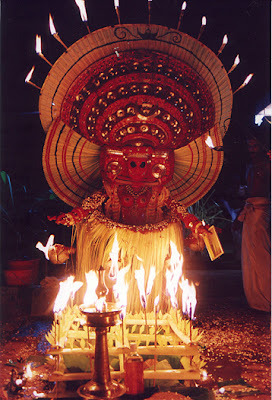 It is interesting to note that the arrangements for vishukkani will be completed in the previous night & this consists of a nilavilakku(which is a lighted traditional lamp), an idol of lord Krishna, & some other items like arecanut(adakka) , betel leaves(vettila), raw rice(unakkalari), kanikonna( konna flowers), cucumber(vellari), vaal kannadi, coins & holy text which are kept in a uruli(shallow circular vessel with an open mouth). 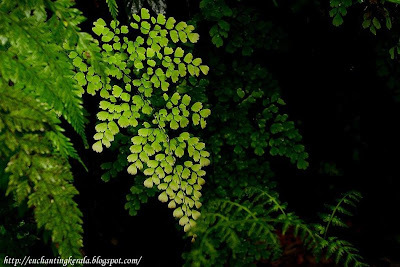 Uruli is most commonly seen in all houses of kerala. Remember that these arrangements are made in the puja room of the house. 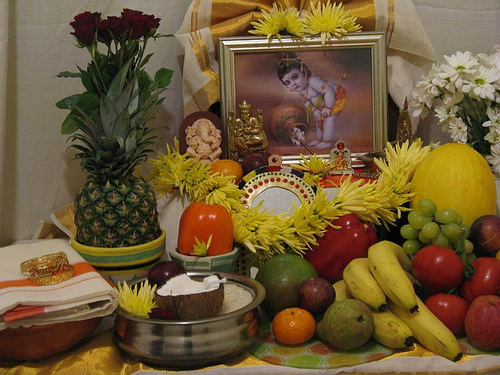 Vishukkani is prepared in such a way so as to bring prosperity to the house in the New Year. This is mostly celebrated by the Hindus. 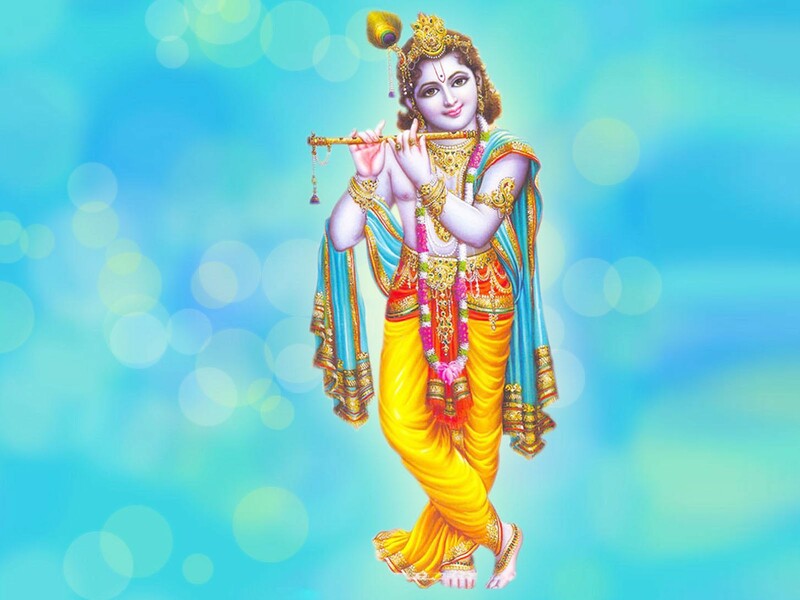 Another fact to remember is that on the vishu day it is important to wake up at dawn & with the eyes closed you must go to the puja room for observing vishukkani. 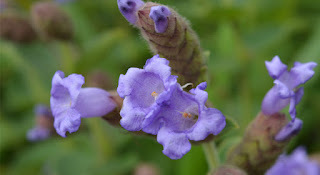 Remember that by seeing vishukkani you are able to see the first sight of the New Year.Vishu Kani is later distributed amongst the poor and needy people. Reason behind this ritual is the strong belief of the people that the fortune of the rest of the year depends on the first object they see on the Vishu day. There is also a tradition to give small amounts of cash to children of the family. This tradition is called Vishu Kaineetam. People believe that this custom will ensure prosperity for their children in future. A grand sadya (feast) is prepared by women of the house and the wholefamily sits together at lunch to relish it. Dishes are usually prepared fromjackfruits, mangoes, pumpkins, and gourds besides other vegetables and fruits,which are in plenty at that time of the season. People also wear kodi vastram (new clothes) on this day. Patassu (fire crackers) are burst in the midstof dancing and merry to mark the day. A group of young men and women dress up as 'chozhi' , wearing a skirt of dried banana leaves and masks on their faces and go from house to house in the village dancing and collecting small amounts of money. On Vishu, these entertainers get good rewards for their performances. The money is spent on the Vishuwela (the New Year Fair). 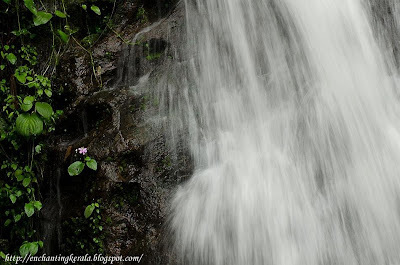 The beautiful, rushing, eye charming Vazhachal water falls is located on the way from Valparai to Chalakkudi road, in the Thrissur District, Kerala in India. 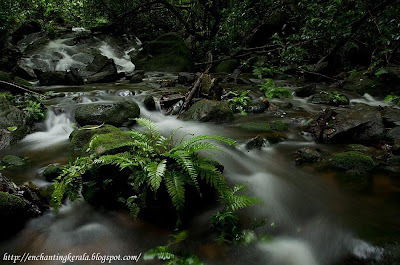 It is located approximately 3 km from Athirappilly and is one of the most beautiful waterfalls in India. For tourists coming to this spot its always a beautiful memory to keep in mind... even after returning home.